Everyone needs some gold in their bank. Toons need it for all kinds of things like: repairs, food, equipment upgrades, bags, expanding bank slots, paying those pesky trainers and flight masters, buying mounts and paying for the new dual specializations. Characters never seem to run out of uses for those shiny coins. 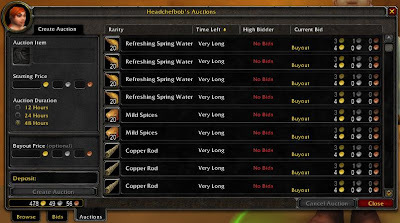 Lots of us don't have the time or patience to farm stuff or sit in the Auction House for endless hours waiting for someone to list their stuff way below the market price so you can snag it at what you hope is a bargain. You have better things to do with your very limited play time. 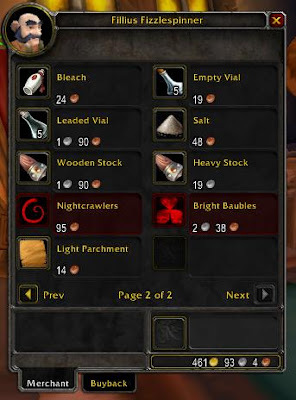 Spend a few minutes every time you play and search out some vendors that sell the most basic supplies i.e. : Refreshing Spring Water, Simple Flower, Empty Vials, Mild Spices, etc. Then go put them up for sale in the Auction House. You get the picture. 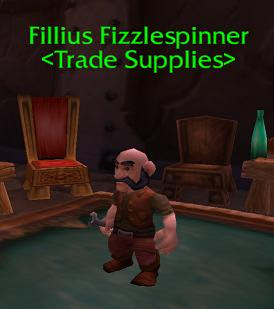 Lots of players hate spending time running around on simple errands while trade-skilling. They are happy to pay a few gold for the convenience of getting a stack of "Refreshing Spring Water" or something they need to complete their trade-skilling task. Every city has some "out-of-the-way" vendors that people hate running to for trade-skill components. 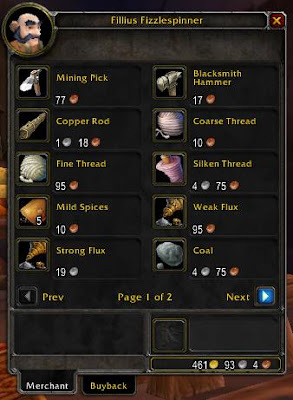 Since the Auction Houses for each faction are connected, a vendor item that might be nearby your Auction House might be a P.I.T.A run from the Auction House in the other city. Make Arbitraging part of your routine each time you log out. 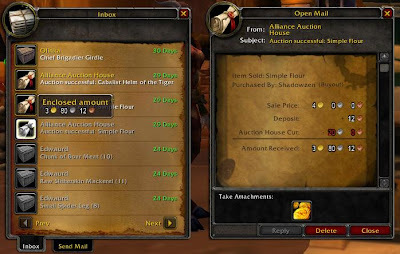 Use your main toon, bank alt, or create a character specifically for arbitraging. Just stick to this process and you will definitely see results. With less than a few hours of total playtime, even your lowest level toons can earn their keep. I guarantee it! 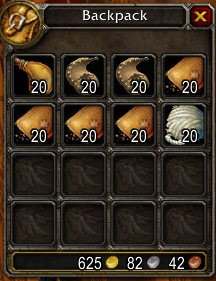 Each server's economy is a little different but, on average, stacks of trade supplies sell for 3 to 4 gold. Keep a wide variety of inexpensive items listed at reasonable prices, and your toon's wallet will start to fatten up! 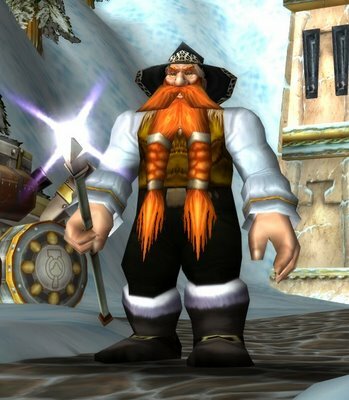 The good lookin Dwarf in the top corner of this post is Bob, my level three (3) Chef & Auction House toon. Thats a snapshot of his backpack taken June 7th, 2009. Bob doesnt get much playtime, but he manages to finance most of my other toons on Arygos. His total Gold Acquired from the methods described here is 1,376 gp. (Remember, my Warlock just made over 3,600 gp from relatively short fishing expeditions.) I don't get much playtime, but my toons are loaded for bear. Maybe its time for a few rounds of drinks for the house.